Ultra compact and space saving. Packs down and stores in bell. 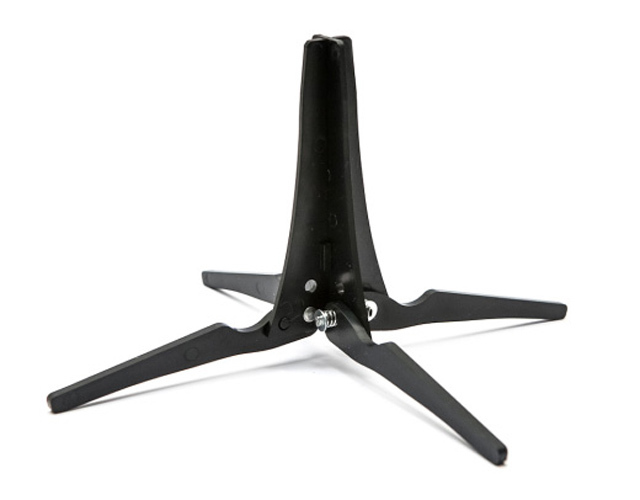 Small leg base when assembled. This item is made of a lightweight plastic to ensure it is easy to transport and will really keep the weight of your equipment down whilst providing adequate support for your clarinet. If you are looking for a heavier weight extra sturdy option to keep at home or in the studio you may wish to try the K&M range of Clarinet stands. Although the clarinet pack - a - stand is perfectly functional, I was a little surprised when the product arrived as to how insubstantial it was, considering I had paid over Â£15 for it. The product information gave no indication that it was made of plastic and extremely light. The supplier responded:Many thanks for your recent purchase and feedback. The pack-a-stand is indeed quite lightweight which helps keep the overall weight of your equipment down and obviously helps make it very portable. It is designed to be used 'on the go' as opposed to the sturdier metal stands that are for home or studio use etc. We've added some extra text to the description that reinforces the concept that it's a lightweight option and hopefully that will help people decide and give them enough information etc. That text will show in 24-48hrs online on this product which is Â£11.95. Thanks again for your order and comments. I bought one of these a couple of years ago when I upgraded my clarinet and it's still going strong! Fits fine into both the bells of my clarinets (RC Bb and E11 A) and is extreamly usefull for any rehearsals. Purchasing a second one for orchestra now - I know it will work and last!